Is the warming Arctic incubating a methane monster that could unleash mass extinction on Earth? 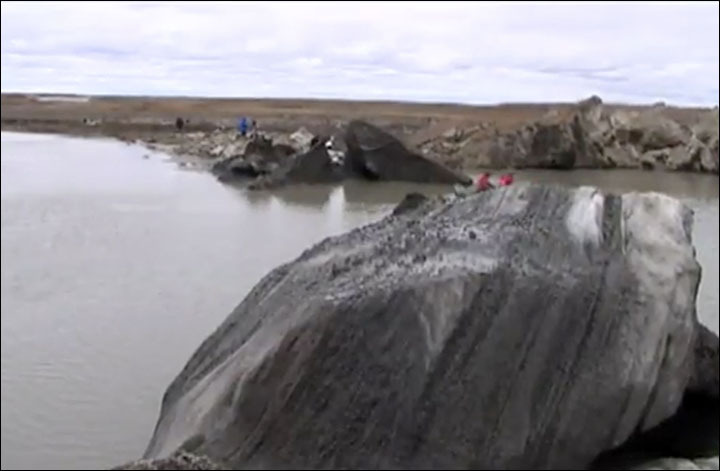 Startling details have emerged of last week’s methane gas blowout on an Arctic riverbank: a sudden and deafening bang from a large explosion of the ground near a reindeer encampment, fire shooting into the sky and raging for several minutes from the eruption, huge chunks of charred permafrost blown out of the ground, and a deep, eerie crater forming, some 50 metres deep which immediately filled with water. Reindeer and dogs fled in fright. Sand and grass was blackened by the intense heat of the eruption which was described as ‘a flame of fire and then a rising pillar of smoke’. 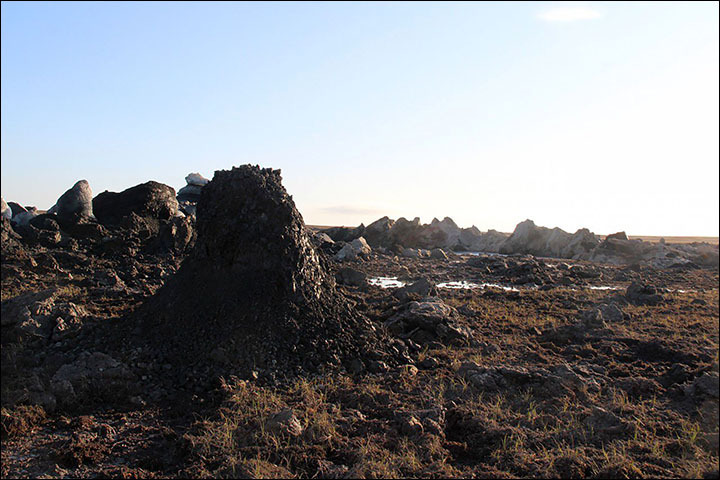 Scientists rushed to the scene on the Yamal Peninsula to examine the site in the immediate aftermath of the explosion, amid expert warnings that many can be expected as a warming climate leads to thawing permafrost and the release of potent methane gas which has lain frozen under the surface for thousands of years. 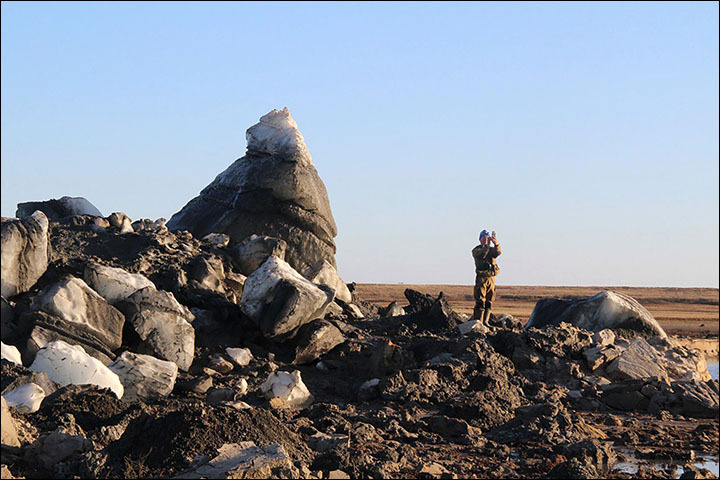 The ground is ‘swelling’ at more than 700 sites on Yamal – known to locals as ‘the end of the world’ – have been identified as potential explosion sites, but these are seen as the tip of an iceberg. Many are hillocks or knolls, some are pingos. 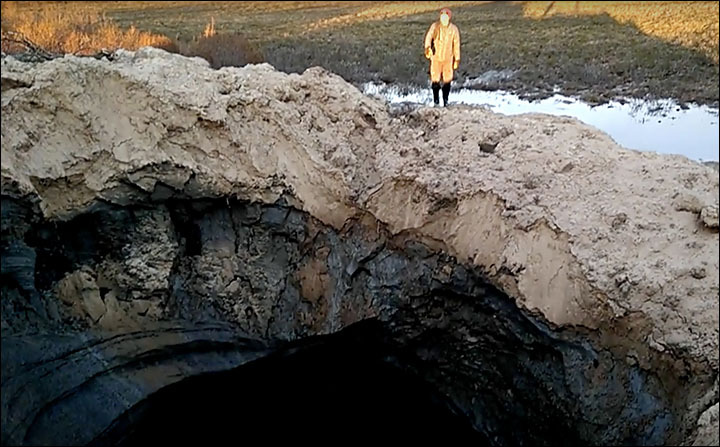 Professor Vasily Bogoyavlensky, Russia’s leading expert on this recently-noticed phenomenon of blowout craters, rushed from his Black Sea vacation to examine the debris. 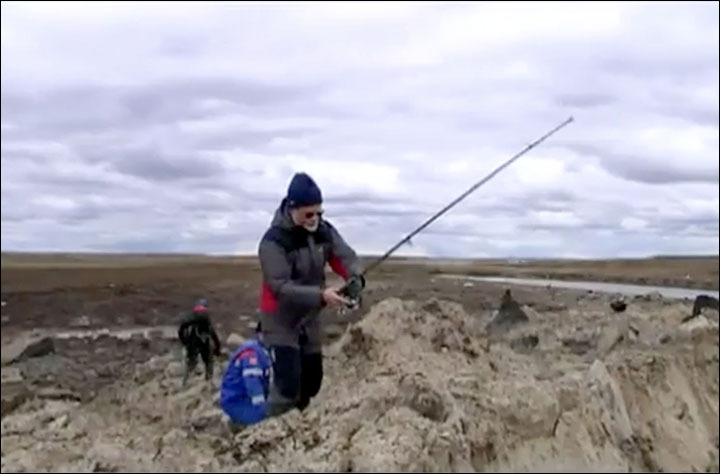 The explosion and the resulting hole near Seyakha village is the latest of a dozen or so substantial known craters to form in Arctic Russia, mainly on Yamal, since 2014. 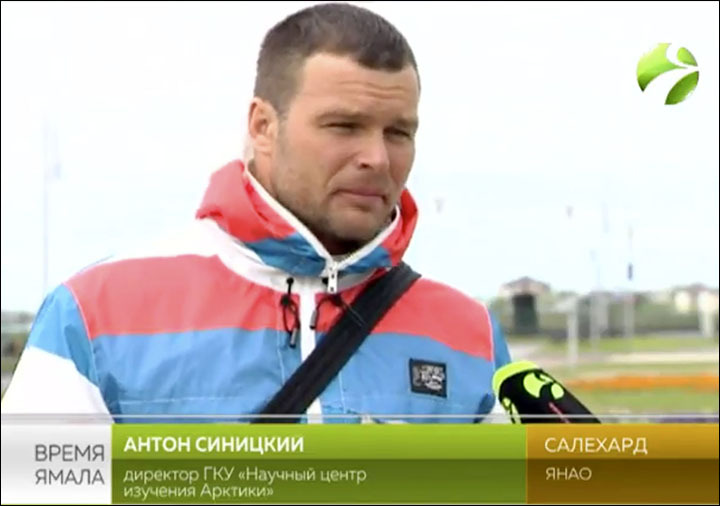 Mikhail Okotetto told TV channel Yamal-region of a fellow herder who was close to the eruption. Dr Anton Sinitsky, director of the Arctic Research Centre, Salekhard, admitted to being startled by the force of the eruption. ‘I am still slightly shocked,’ he said. It was ‘beyond any doubt that there was an explosion because charred sand and charred grass are visible by the funnel’. He expressed the fear that such funnels ‘can pop up anywhere’ in permafrost Yamal. 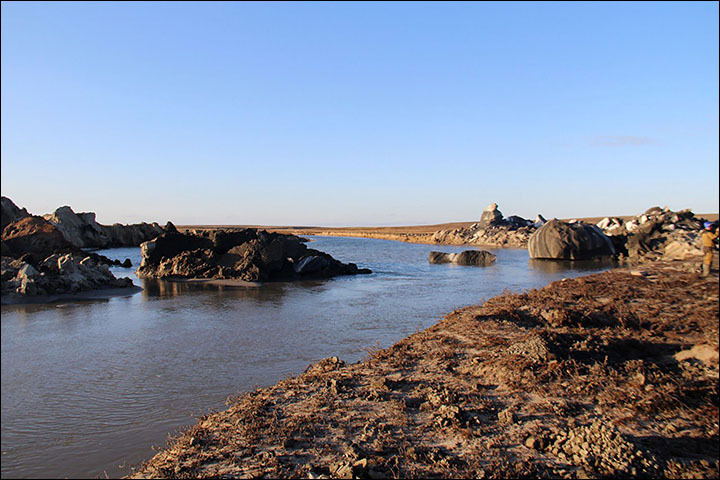 Alexander Mazharov, deputy governor of Yamalo-Nenets autonomous region, said: ‘It is very important for us also to know what to do because such an eruption can occur anywhere. Yamal has the biggest concentration of natural gas fields on the planet, and these can be threatened by exploding ground. 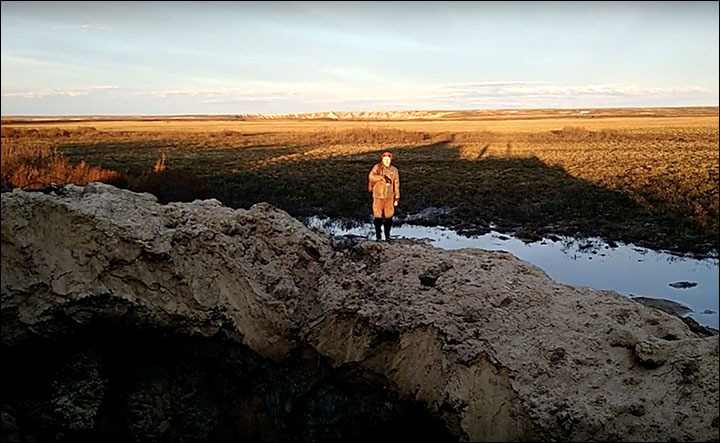 Dr Bogoyavlensky, deputy director of the Oil and Gas Research Institute, Moscow, sought to use an echo sounder to measure the depth of the submerged crater – but it was too deep. 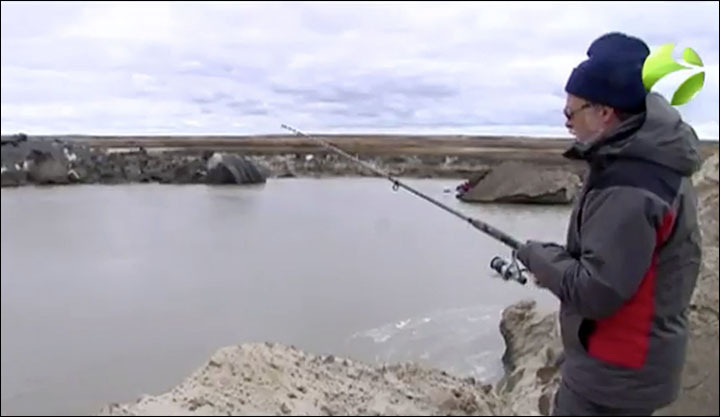 He resorted to casting a fishing line into the water, and it is close to 50 metres deep. 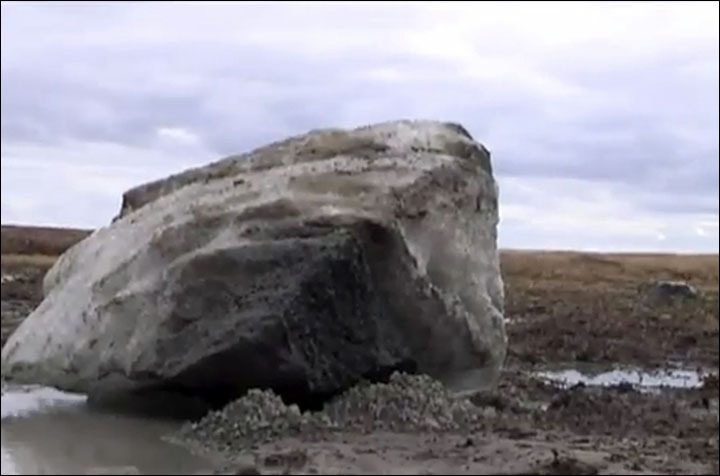 Strong degassing of the subsoil is occurring in the bloated and thawing tundra, he said. In other places it can seep through the surface, but here the unevenly frozen surface layers can mean pockets of methane collect with explosive force. 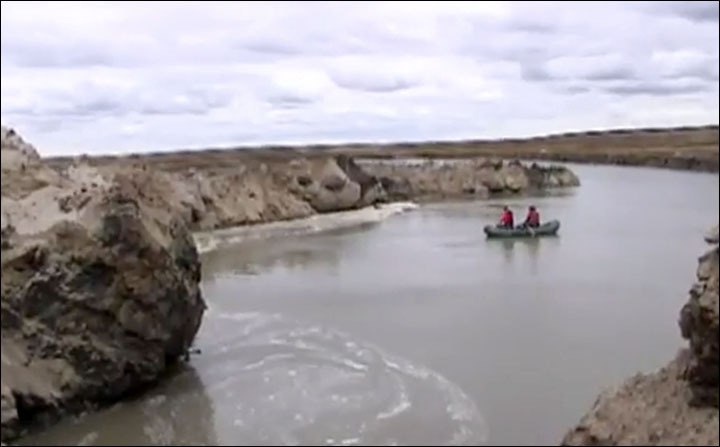 Such explosions can scatter a large tonnage of rocks hundreds of metres away from the blowhole, said one Yamal report. 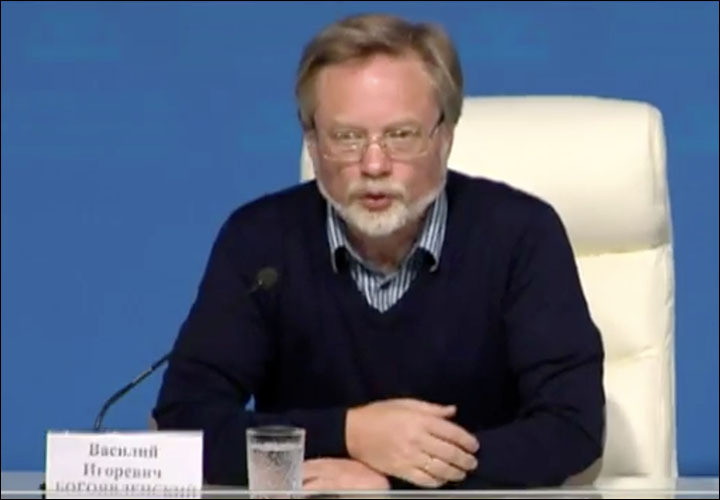 ‘Actually (degassing) is happening in all countries of the world, onshore and offshore,’ said Dr Bogoyavlensky. 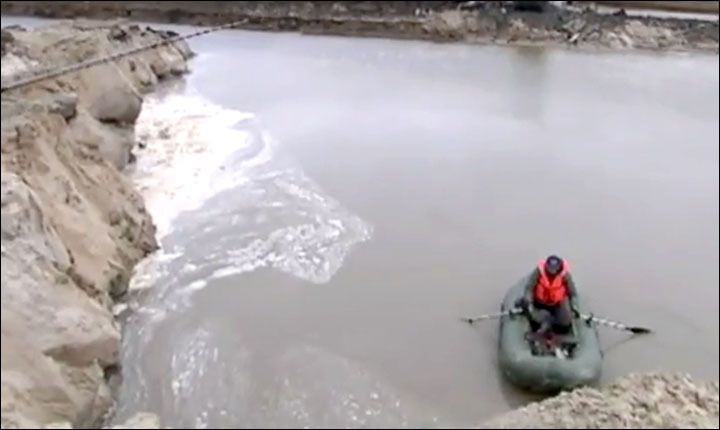 ‘Strong degassing is occurring in the Arctic. Seismic sensors timed the explosion at 11am on 28 June some 30 kilometres north west of the remote village of Seyakha. 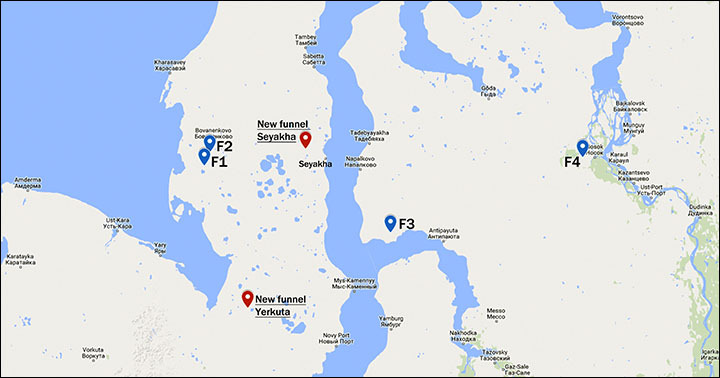 The site is around 100 km of Russia’s new state-of-the-art Arctic port of Sabetta. 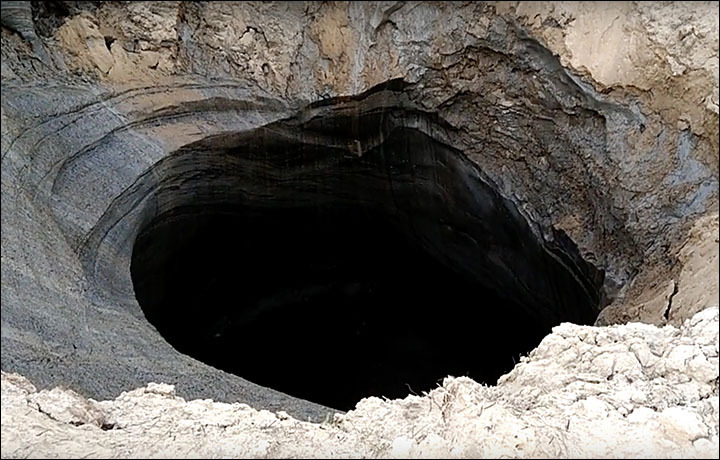 A second new crater – which exploded into being earlier this year – was also located this month by a group of scientists led by Dr Aleksandr Sokolov, deputy head of the ecological research and development station of the Institute of Ecology of Plants and Animals, in Labytnangi, Tyumen region. A mound of land along edges of the funnel confirms the fact of the explosion, he said. ‘This plot of land was absolutely flat just two years ago,’ he said. It is believed the eruption was in the early part of this year. 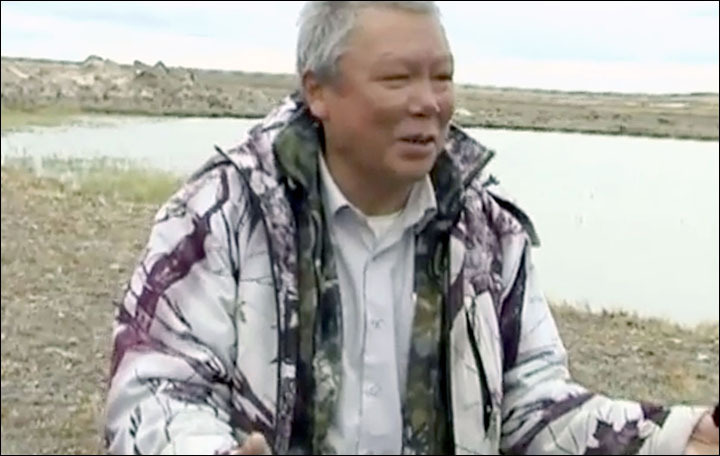 ‘The Nenets native people told us they saw fire in winter 2017, but it might mean January to March or April. This crater is around 30 km east of the Yerkut scientific station, and some 230 km north of Salekhard.